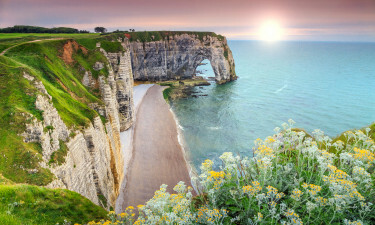 Located on the northern coast of France, Normandy is a region which comprises nearly 5 per cent of the entire country. 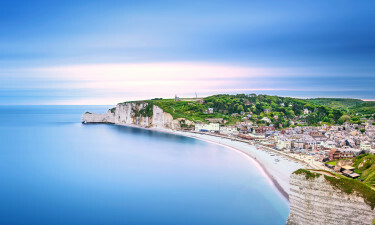 Boasting pristine coastlines, an amenable climate and a wealth of natural attractions, Normandy is a popular tourist destination. Please contact Lux-Camp to learn more should you desire to visit this amazing location. Cave paintings have shown that this region has been inhabited by humans since prehistoric times. However, it is the eclectic mix of different historical cultures such as the Britons, the Vikings, and the Franks that has allowed Normandy to offer such a diverse history. Famous for the beach landings during World War 2, Normandy now offers several attractions to enjoy alongside quality camping sites. Due to the natural beauty found here, Normandy is likewise extremely popular as a luxury camping destination. Why should I camp in Normandy? La Côte De Nacre is a renowned site that provides camping luxury on numerous levels. It offers 507 individual pitches as well as the ability to enjoy quality mobile homes during a stay. On-site amenities include a sauna, an open-air swimming pool, table tennis, bicycle hire and more. Camping Le Cormoran is another holiday camping site found within Normandy. It offers no less than 256 pitches that are all found quite close to attractions such as outdoor pools and jacuzzis while the luxury camping site itself is located only metres away from the beach. Camping Le Grand Large is a camping holiday resort that offer 232 pitches with modern amenities such as wireless Internet and 20 individual washing cubicles. All locations are equipped to accommodate the handicapped. Bread and snack food outlets are found on the site itself. Some popular attractions here include Mont Saint Michel Abbey, the Bayeaux Cathedral and the Caen Botanical Gardens. Also, nearby cities such as Rouen, Caen and Le Havre display an interesting culture alongside modern infrastructure and countless restaurants. 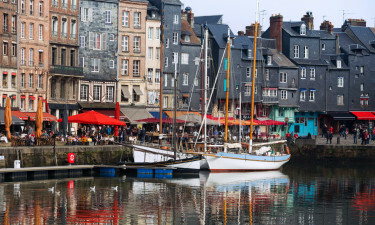 Normandy is known for rich meats such as veal and fresh fish from the nearby ocean. A number of wines are produced here due to its warm climate and local drinks such as Eaux de Vie are quite tasty. Residents are friendly and most speak an appreciable amount of English. Please enquire. Some of the top beaches here include Utah Beach, Gold Beach and Trouville. All provide spectacular views of the English Channel and they are inviting during the warmer months of the year. Some top nature preserves include Orne Bay and the Bois du Breuil Forest. Many campsites are found close to these regions.